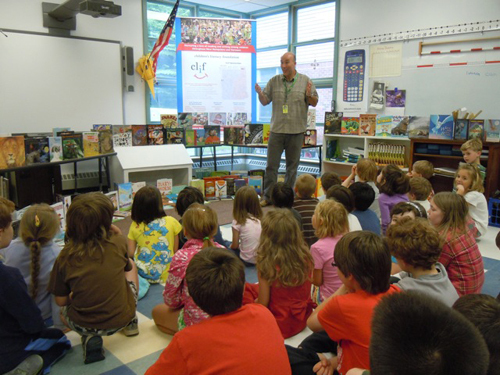 Librarian Steve Madden describes the Bolton Little Free Libraries project to his students at Camel’s Hump Middle School. Until recently, Bolton, VT (pop. 971) did not have its own public library. Steve Madden, a middle school librarian, decided to remedy the situation. With help from local friends, he built five! Each is a compact wooden structure (picture a small dog house on a post, with a plexiglass front) hosted by a local resident or organization on their land and filed with books that anyone can borrow at any time. CLiF was delighted to start the collection with a grant of $2,000 worth of new children’s books that Duncan delivered at a fun storytelling event for the children in Bolton’s Smilie School. The Bolton Little Libraries was inspired by a program in Wisconson called Little Free Library. You can learn more about The Bolton Little Libraries on Facebook. Enter email address to receive new blog posts by email.